Emaginationz Technologies are well known for our open source technology services in Mumbai, Navi Mumbai and all over India. Our experience on the open source technologies is extensive. Our project Portfolio includes e-commerce applications, travel portals, social networking websites, business applications, content management solutions, CRM, classifieds, real estate portal, multilingual website and a whole lot more. We lay emphasis on delivering high quality open source solutions like PHP application development, Joomla development, Drupal integration, Wordpress integration, B2B open source solutions, ecommerce website development and also establishing, maintaining long term relationships with clients. Our core strength lies in the delivery of solutions on the open source platform. Offering open source cms services to clients across various domains. Our design and development services range from providing custom solutions; integrating and customizing open source software development applications like Joomla, Drupal, Sugar CRM etc; rich internet applications, remote server administration and migration services like static to dynamic sites and PHP4 to PHP5. Our Website Development Team comprises of dedicated php mysql programmer, drupal developer, joomla developer, sugarCRM consultant who can produce high quality secure and dynamic website applications. We deliver services for open source technologies using LAMP technology (PHP/MySQL) and Rich Internet Application. We are not restricted to any one technology but are open to adopting and using new technologies. 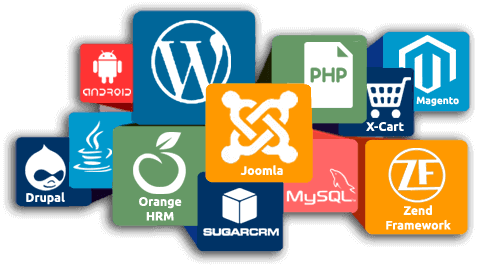 Our areas of expertise includes, but is not limited to, PHP, MySQL, PostgreSQL cakePHP, Zend Framework, Joomla!, Drupal, Wordpress, SugarCRM, Magento, AJAX, JSON and Flex. To Design and Developed your own Website with our open source technology services with affordable price range, Contact us today.